A while back, the Wall Street Journal published a piece on the rising confusion between Android phones and Samsung’s ubiquitous Galaxy line of devices (I did my own little story on this as well). The piece was widely circulated, largely because, in my opinion, it’s dead on. Much in the same way that some people use–and still use–“Droid” (a Verizon marketing term for a certain line of Android smartphones) to refer to all Android devices, people are now labeling all Android phones as Galaxy phones. It’s not surprising, given how flooded the market is with Galaxy devices of all shapes and sizes. The story also suggested that, for a variety of reasons, Google may not be entirely comfortable with this phenomena. I’m no industry insider, but I think the decision to name (or possibly rename?) 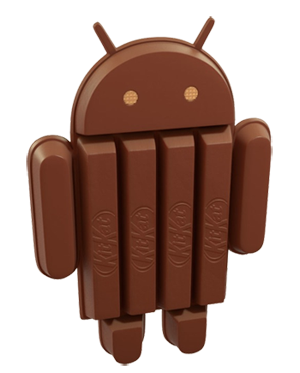 the next version of Android KitKat could very well represent Google’s desire to win back the Android name. Like Samsung, KitKats are a widely-recognized brand, with domestic and international marketing infrastructure. They’re everywhere: at the checkout line in the grocery store, in vending machines at the office, and, in about a month, will be toted home by the sackful after a successful evening of trick or treating. The more people physically see the name Android out in the wild, the more they’ll think about it, recognize it and, in all likelihood, begin thinking of their Android smartphone, rather than their Samsung Galaxy smartphone. Name recognition increases, and Android grows stronger. Plus, if you’re like me, and you get giddy at the thought of devouring candy, maybe a bit of that giddiness will eventually rub off on you when you think about Android. It makes perfect sense. Yes, it’s all about cross marketing. Yes, it’s also about Google being Google and doing something cool and fun. But, in a way, it’s also about protecting the fort.